Over the years, the US Tax Court has reviewed many cases when casino win/loss statements (or their equivalent) were offered into evidence by the taxpayer. None of the Tax Court judges found the documents helpful or persuasive. Lets examine each of these cases in turn. On September 20, 2000, Judge Swift published the Tax Court Memorandum Opinion of Mayer v. Commissioner of Internal Revenue , T.C. Memo. 2000-295, 2000 WL 1349156 (U.S.Tax Ct.), 80 T.C.M. (CCH) 393, T.C.M. (RIA) 2000-295, 2000 RIA TC Memo 2000-295 (U.S. Tax Court 2000). At trial, petitioner submitted an unsigned letter (a casino win/loss statement) from Caesar’s Palace that indicated the taxpayer had put $898,050 into the slot machines (“Coin-In”) and had estimated slot machine winnings of $837,570 (“Handpaid Jackpots” plus “Coin-Out”), for an estimated net gambling loss of $60,480. Please note the tracking system used to arrive at estimated win or loss information provides estimates only and does not constitute an accurate accounting record. * * * This information should be used as a supplement to your own records or information. The Caesar’s Palace letter we regard as highly suspect. It is unsigned. By its terms, it is only an estimate and is to be supplemented by petitioner’s own records. We regard the letter as unreliable evidence and give it no weight. In summary, the only evidence the taxpayer had to prove his gambling losses was a casino win/loss statement, and the Court held that it was not enough. On April 4, 2002, Judge Thornton published the Tax Court Memorandum Opinion of Lutz v. Commissioner of Internal Revenue , T.C. Memo. 2002-89, 2002 WL 506881 (U.S.Tax Ct.), 83 T.C.M. (CCH) 1446, T.C.M. (RIA) 2002-089, 2002 RIA TC Memo 2002-089 (U.S. Tax Court 2002). Ronald and Paula Lutz were recreational gamblers that frequently visited casinos in Louisiana and Mississippi. During 1996, they did not keep any records of their gambling activities. 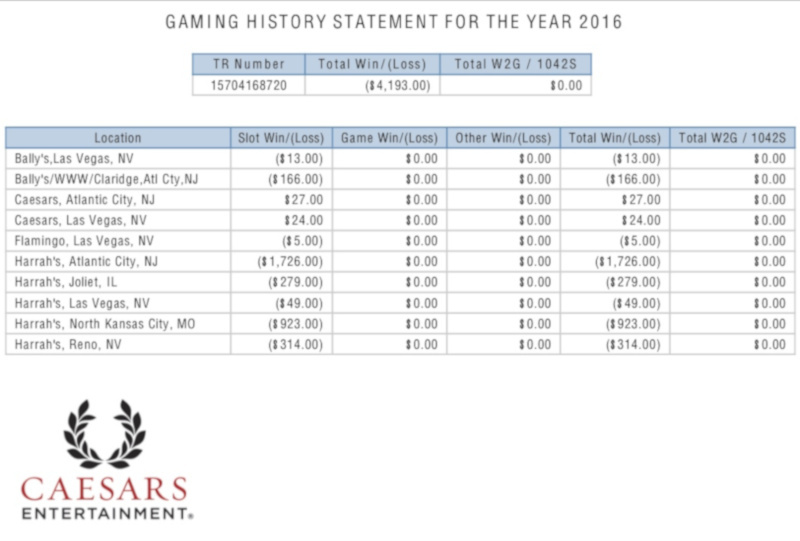 Instead they relied upon Trip History Reports (also known as casino win/loss statements) from the various casinos. Prior to trial, the taxpayers and the IRS agreed upon the amount of gambling losses related to table games. Consequently, Judge Thornton was only called upon to consider the casino win/loss statements as they applied to the slot machine play of the taxpayers. [T]hat the letters are unreliable indicators of petitioners’ gambling winnings and losses, failing in particular to reflect either slot machine winnings or losses. This lack of any credible evidence left the taxpayers with a no gambling losses whatsoever – but Judge Thornton recognized that the taxpayers had to “invest” something in order to receive these amounts. Using a payoff ratio of 20 to 1, Judge Thornton allowed the taxpayers to reduce the amount of their gambling winnings by using a “recovery of capital” rationale. On December 5, 2007, Judge Wherry published the Tax Court Memorandum Opinion of Hardwick v. Commissioner of Internal Revenue , T.C. Memo. 2007-359, 2007 WL 4257478 (U.S.Tax Ct.), 94 T.C.M. (CCH) 523, T.C.M. (RIA) 2007-359, 2007 RIA TC Memo 2007-359 (U.S. Tax Court 2007). A win-loss statement is generated from a Players’ Club card, which is a magnetically encoded card that patrons of a casino may use when playing slot machines. The Players’ Club card enables the casino to track a patron’s gambling activities by date and time, slot machine winnings and losses, and may provide free “comped” room, drink, and food for “high rollers”, or points that may be exchanged by the patron for food, drink, or merchandise. In this case, the available evidence included IRS Form W2-G’s, a gambling log kept by the taxpayers, casino win/loss statements, bank statements and the taxpayers own testimony at trial. In other words, Judge Wherry relied upon casino win/loss statements to impeach the credibility of the taxpayers’ other evidence. Once this was accomplished, Judge Wherry then relied upon the amount of gambling losses as determined by the IRS of gambling winnings and gambling losses suggested or agreed upon by the IRS. Instead of using the casino win/loss statement as a shield for the taxpayers, the IRS and the Court used it as a sword against the taxpayers. This is an important lesson to remember. On June 5, 2008, Special Trial Judge Goldberg published the Tax Court Memorandum Opinion of Merkin v. Commissioner of Internal Revenue , T.C. Memo. 2008-146, 2008 WL 2316491 (U.S.Tax Ct.), 95 T.C.M. (CCH) 1576, T.C.M. (RIA) 2008-146, 2008 RIA TC Memo 2008-146. During the relevant time of his audit and trial, Dr. Merkin was a self-employed psychiatrist with an office on Park Avenue in New York City. In 1999, Dr. Merkin began to play video poker and spent most of his time at the Mohegan Sun Casino in Uncasvile, Connecticut. The primary issue in his Tax Court case, was whether or not Dr. Merkin’s gambling activity allowed him to qualify as a professional gambler. Judge Goldberg held that it did not, but instead Dr. Merkin was a recreational gambler. In conducting his analysis, Judge Goldberg relied upon the U.S. Supreme Court’s analysis in Commissioner of Internal Revenue v. Groetzinger , 480 U.S. 23, 35, 107 S.Ct. 980, 94 L.Ed.2d 25 (1987), and the nonexhaustive list of factors in Golanty v. Commissioner , 72 T.C. 411, 426, 1979 WL 3683 (1979). Dr. Merkin did not carry on his gambling activity in a businesslike manner. See sec. 1.183-2(b)(1), Income Tax Regs. He did not maintain any receipts, books, or records but instead relied solely upon Mohegan Sun to track all of his playing time, betting history, wins, and losses on his Player’s Club card. Judge Goldberg then went on to use the information contained in the casino win/loss statements against the taxpayer. For example, Dr. Merkin testified at trial that as a “professional” gambler he spent 47 out of 52 week-ends engaged in his secondary occupation for a total of at least 1,128 (assuming a minimum of 24 hours per week-end). Unfortunately for Dr. Merkin, his casino win/loss statements documented only 319 hours. [W]e note that petitioners failed to report as income the value of any car, airfare, or travel that they acquired from the casino in 2003. That is certainly a big oops! The moral of the story is that casino win/loss statements are not the “quick-fix” panacea they appear to be, and that when dealing with the IRS there truly is no substitute for proper recordkeeping.